In a holiday that rivals St. Patrick’s Day in terms of sheer debauchery, Halloween in Chicago is known as a time for raging EDM and ridiculous house parties. But that doesn’t mean you still can’t pay tribute to the kid in you with a nostalgic trip out to a local haunted house. While the pickings are slim in the city itself, make the trip out to the suburbs to give yourself a good old-fashioned scare. You know, the kind that doesn’t involve turning on the TV and flipping over to cable news. Long regarded as one of the top haunted houses in Illinois, you’ll first make your way through 23 terrifying cells in this maximum-security prison to fend off attacks from 100+ evil inmates before heading outside the prison gates to the caves, mine shafts, and mass graves of the zombie-laden City of the Dead. If that’s not enough, you can climb into the back of an authentic Army carrier truck and hunt zombies with paintball guns mounted in front of you. 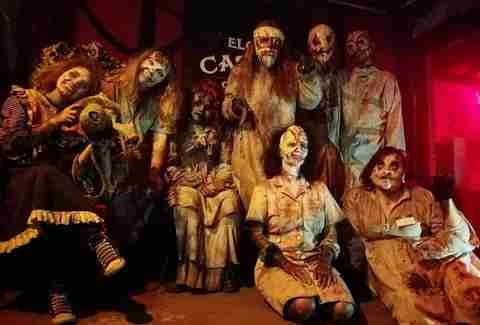 Known for movie-quality sets (including actual set pieces from Saw) and fear experiences designed for more mature audiences, this custom-built haunted house features 20,000 square feet of terror across 60 rooms that include tombs, caverns, mazes, and a 360-degree 3-D haunted house. They’ve even installed a new DJ booth for 2017 and while you’re there, check out their escape rooms and laser tag facility for an adrenaline rush and good old-fashioned fear. Named the “No. 1 Haunted House in the World” by the BuzzFeed community, this haunted house is known for taking advantage of its natural setting in the basement of a creepy 100-year-old building in downtown Aurora to scare the crap out of people who are afraid of the dark. As one of the darkest haunted houses in the area, the dim lighting enhances the horror movie aesthetic while guests are given a handheld black light to navigate their way through the haunted circus-themed 3-D experience in what is reputed to be the world’s first and only 3-D flashlight haunt. Haunted houses are great and all when you just want to get scared to the bejesus, but don’t you sometimes wish you could fight back? That’s the idea behind this sprawling 40,000-square-foot haunted house in Santa’s Village, where guests are armed with a gun that fires lasers at all the monsters and creepy characters who terrorize this top-secret government facility in Chicago’s only haunted house that combines laser combat with a traditional haunted house. Located in the old Briquette factory in a dreary industrial park surrounded by woods, it takes a full 60 minutes to make your way through the variety of scare rooms such as the slaughterhouse, embalmment room, and “human grinder” room in this 42,000-square-foot house of horrors. But the main attraction of this adult-geared assemblage of savagery is its unique Buried Dead or Alive feature, in which everyone in your group will be physically buried to experience the claustrophobic sensation of being buried alive. While relatively new on the scene, this massive haunted house (claiming to be Chicago’s largest) is already well established as one of the best in the area. With beautifully detailed sets across two separate haunted houses, “Cursed: Purgatory” will have you meandering amongst witches chanting demonic spells while “Dead End District: Freakshow” features shadows of inhuman beasts soundtracked by screams. For an extra scare, stop by November 3 and 4 for “Blackout,” in which your group will try to make your way out of the house in total darkness with nothing but a single glow stick to light the way. The themed experience at this 25,000-square-foot haunted house begins on the five-minute interactive shuttle from the parking lot, and doesn’t let up until you’re finally safe from the wailing chainsaws of would-be killers in its Chainsaw Alley. The haunted houses include Black Oak Grove: The Following, a small town taken over by a shadowy military unit called FearCorps, and a demon-cursed factory called Factory of Malum. Created by an ex-marine in 2014 with 60+ rooms and an optional escape room experience, 85% of the house has been redesigned for 2017. Known as one of the scariest haunted houses in the area, this adult-themed haunted house even comes equipped with its own bar in the waiting area to help you calm your nerves before the show. With professional makeup effects and a healthy serving of gore, you descend down a service elevator before making your way through narrow hallways that open up into fully immersive sets such as an operating room and baby nursery, before ending in a dark maze with all manner of ghouls popping out to scare you at just the right time. Stop by November 4 to get covered in blood during their Blood Bath event. The naturally decrepit setting of the 55,000-square-foot Old Elgin Casket Factory offers the perfect environment for this haunted house that is reportedly actually haunted by some of its former residents. Whether or not that’s true, there’s no denying this is one of the top haunted houses in the area with super professional crews and plenty of scares via coffin mazes and other unique flourishes that play off the building’s sordid history. They also offer ghost tours and a Survive the Night overnight escape room experience. Probably the most theatrical haunted house in the area, this new addition (opened last year) differentiates itself from the pack with a multi-level mansion hidden in the woods. After you park in the nearby Metra lot, a shuttle bus drops you off in the woods and you must make your way past the cemetery before finding the house. 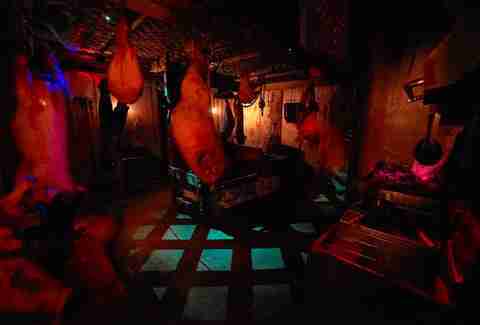 Inside, you’ll find terror-stocked rooms like a doll room with life-sized dolls and a lab area with live animals. After you escape from the house via a giant slide, you get a chance to find the key to HellsGate (“find the key and your ticket is free”) in a dark room illuminated by a glow stick. 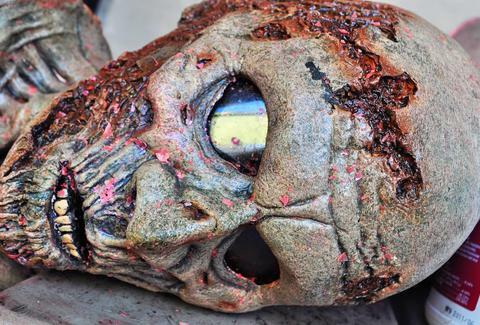 If it’s been a while since you’ve visited Six Flags Great America, you might want to reconsider making the trip if you’re a fan of haunted houses. Or, shall we say, multiple haunted houses and “scare zones” including The Massacre Ball and Slasher Circus, not to mention a variety of entertainment including live hypnosis, carnival-style freak shows, and the world’s largest synchronized LED light show. 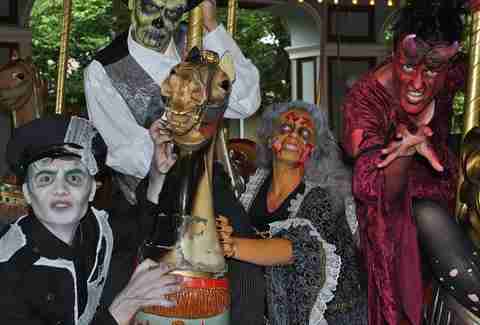 You can also, of course, ride the rides and interact with the monsters who roam the park at this granddaddy of haunted house experiences. In just its third year, this haunted house (brought to you by the folks behind 13th Floor Haunted House) is known for its nightmarish Hollywood-quality sets and intricate themes that this year include The Frenzy -- based around a new breed of deadly insects and creatures unleashed after a horrifying government experiment put the city of Morton Grove on lockdown -- and crowd favorite Nightmare High: Fall Harvest, which is chock full of zombie cheerleaders and undead teens who star in this multilayered psychological thriller. If you're a complete fright fiend, check out our other guides to find the best haunted houses in Atlanta, Denver, Houston, Michigan, New Orleans and Virginia.